I took a vacation with the family up north recently, and did some research before I left. Since I was going to be fishing mostly clear water, I did some reading on how best to fish musky in clear water. I’ve always suspected that deeper, open water was the way to go but never had the confidence to really attack it. However, after readying some great information on Andy Meyer’s website, I was ready to give it a good shot. I identified some new water with varying depths that I wanted to try out and planned on when to try each spot. While none of the new spots panned out, I did try a deeper spot off one of my regular spots and was rewarded with this 43″ muskie. I was jerking a bulldawg very aggressively in 30 – 35 feet of water. I was alternating casts into shore, away from shore, and parallel to shore. The fish struck about a fourth of the way into the retrieve of a cast I had made parallel to shore. I think this was the deepest water I had caught a muskie in. Given my recent problems with keeping the fishin hooked, I made sure to drive the hooks into the fish’s mouth. It worked well because the bulldawg was completely inside the fish’s mouth and four of the seven hooks were in the fish. SQL Server is a set based language. For this reason we’re generally not interested in individual rows, more so just the set of rows that a query returns. This is why DBA’s shun cursors and loops. However, sometimes it is necessary to sort out individual rows for sorting or filtering purposes. ROW_NUMBER is a window function that allows us to add a row number to each returned row. We can use OVER() clause to figure out what rows should start with number 1 and when we should stop the current sequence and start over at 1. Let’s think of some interesting questions we could answer with this setup. 1.) What was the size of the second biggest fish caught from each species? 2.) What was the smallest fish caught each month? 3.) What was the species of the biggest fish caught with each type of lure? 4.) What lake was the second last fish caught at each month? To find these, it helps to assign the row numbers in a common table expression, then returns the desired results in a query off that cte. These examples should help you understand some of the great things you can do with the ROW_NUMBER function. As a fishing trip approaches, I like to plan out my expected strategy for my first day. I look at the expected weather (especially wind direction and speed), and try to decide where active fish may be biting. However, once I get out there plans can change very quickly. I remember a trip up north quite a few years ago where, once out on the water, I was facing 25 – 30 mph winds. I was also fishing in a rowboat, and was unable to fish where I wanted because I was drifting through the prime areas too quickly. I had to make an adjustment and focus on spots on the upwind side of the lake. Database administrators also need to be able to make adjustments. It is fairly common to try something one way and find it doesn’t work well or doesn’t work as expected, and have to find another way. 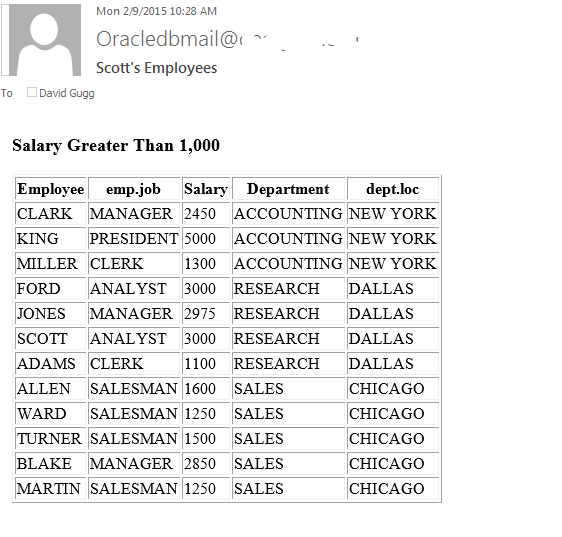 In my last post, I demonstrated how to use ListAgg to make a common delimited list in Oracle. I had planned to use this function to build a stored procedure that would take a query as its parameters and send an email in an html table format with the results of that query. Upon building the query, I found ListAgg has a severe limitation. It returns its results in a VARCHAR2 format only. This means the result set, which is a string of html, could only use 4000 characters, the limit of VARCHAR2. This may seem like a lot, but for an entire result set along with html tags it may not be sufficient. Instead, I used some of Oracle’s XML functions to complete the procedure. First I’ll show the procedure and a sample of its use, then I’ll do a brief description of the xml functions used. 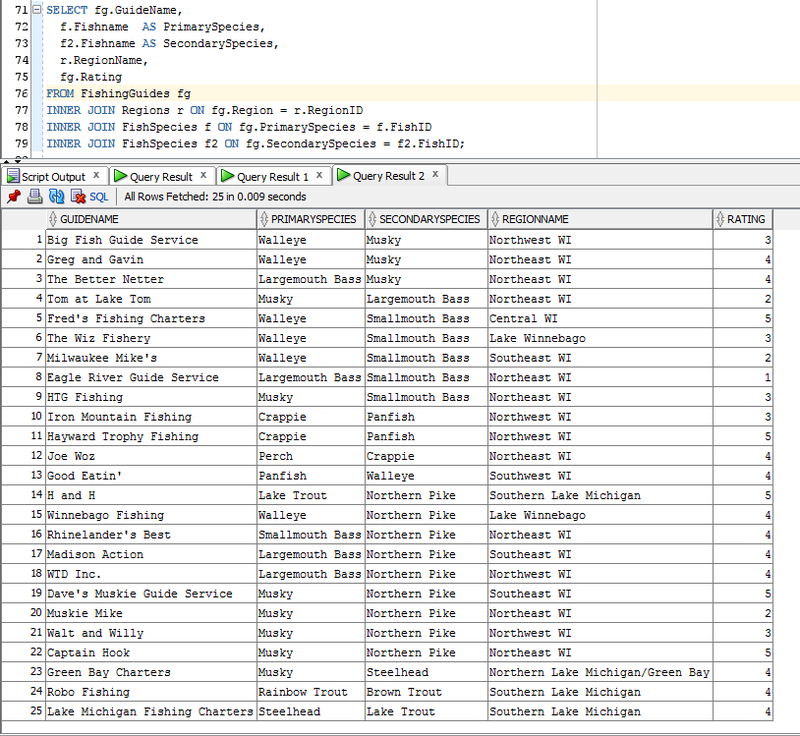 --Start setting up the sql statement for the query. --This next section is required in case a field is aliased. For the xml, we need to get rid of the aliases, the table header will only require the aliases. --NULL values need to be shown as a string = 'NULL' or the html table will just skip the cell and all values after that in the row will be shifted left. --Trim the extra two characters of the end of sql. --Add the from, where, group by, having, and order by clause to the select statement. --Run the sql that will create the xml. --Create the body of the email, which contains the xml results of the query. --If rows were returned, send the email. You need to setup a Access Control List for your user to get to the email server. This can be done with these SQL statements, run as SYS. Now I’ll briefly touch on the functionality of the XML functions. xmlagg – This takes multiple rows of xml and changes it into a single row. This is needed for this stored procedure because we want the html table to control the line breaks, not line break characters created by SQL. xmlelement – This simply turns a returned column into an xml element. The first argument is the xml element name and the second argument is the field. xmlforest – This behaves similarly to xmlelement, but it lets you do multiple columns at the same time. You use comma to separate the columns. Confusingly, opposite from xmlelement you have to first specify the field, than you put the xml element name second. When I first got the requirement to send emails from Oracle, I took a look around the web and couldn’t find any ready-made solutions for sending out query results in an html table. Hopefully this post will help some of you who are looking for the same thing. Two muskie lures that are both effective and quite similar are the Musky Innovations Bulldawg and Chaos Tackle Medussa. These lures are both hard rubber lures without any natural action; the angler is responsible for making the lure move in a way that will get the fish to bite. They can be swam, jerked, bounced, ripped, or any other action you can think of to try to get fish to bite. Although they look quite similar, the action has subtle differences, and knowing these differences tells you which lure to use, depending on your situation. The bulldawg will cut through the water a bit better, and rolls over on its side as you let it fall. The medussa will almost hovers when you let it fall, slowly sinking with a back-and-forth wobble. Though similar, knowing these subtle differences can mean the difference between catching or not catching a fish. 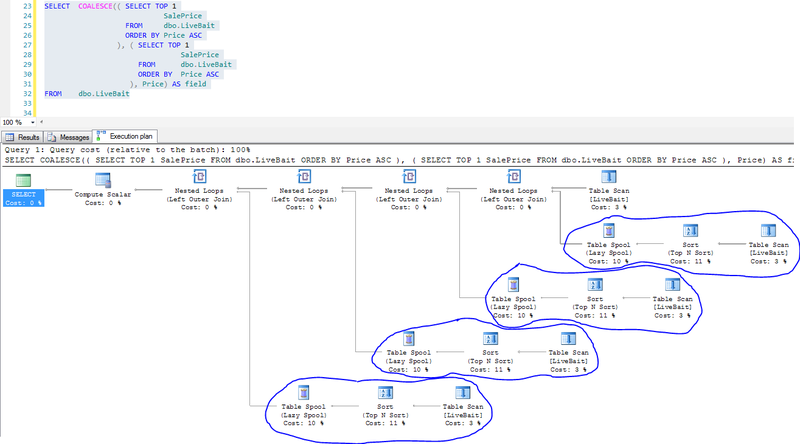 Two SQL Server functions that also have rather subtle but important differences are the ISNULL() and COALESCE() functions. Both functions are used to return another value if the first evaluates to NULL. This can be useful for making sure your query is always returning a result and not grabbing those meaningless NULL values. Now let’s discuss some of the subtle differences between ISNULL and COALESCE. First, ISNULL can only accept two arguments. If the first argument is NULL, the other is returned, even if it too is NULL. COALESCE can accept any number of arguments, and will return NULL only if every one of those arguments are NULL. Coalesce will find the data type with the highest precedence. Here is a list of the data type precedence from Microsoft. Money is higher than char, so we’d still get an error. 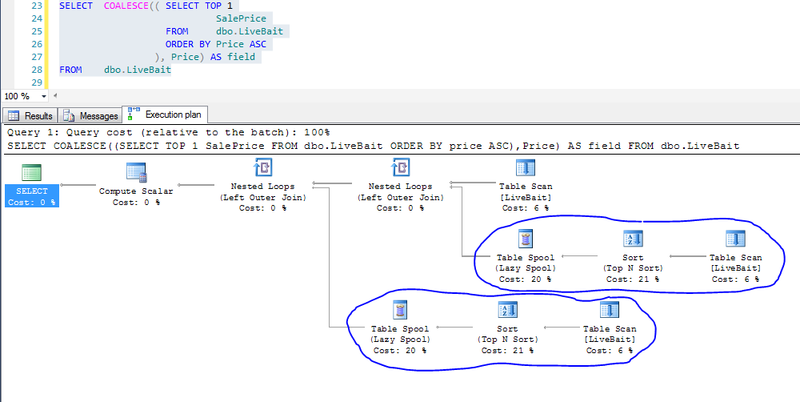 If we look at the execution code, we will see that the subquery, shown by a LiveBait tables scan with a sort, has been performed twice; once to see if it returns NULL and once to return the value. So there are the main differences between ISNULL and COALESCE. I hope this post helped you understand which to use and when.